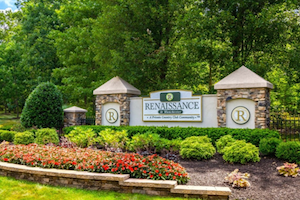 Renaissance at Manchester offers exciting amenities, lovely homes and a prime New Jersey location. Renaissance at Manchester was developed between 1997 and 2007, with residences designed by Centex Homes and Carlton Homes. Today, the gated community includes 1,904 single-family homes, which are available on a resale basis. These homes were specifically designed for active adults. Many are set on private lots with golf course views. Single-family homes throughout the community range in size from 1,522 to 2,256 square feet. They typically include two bedrooms, two full bathrooms and two-car garages. However, the Siena 2 model had the option of being built with just one bedroom and a den, while the Aragon model has a one-car garage. Several models also have a separate den. Popular features include open floor plans with large kitchens and elegant master bedroom suites. Each home also includes a backyard patio for outdoor living. 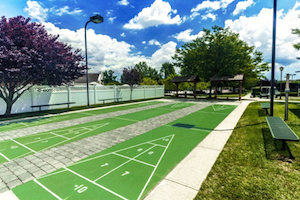 Residents enjoy outdoor activities such as shuffleboard, tennis, bocce ball, pickleball and golf. Beyond its beautiful homes, Renaissance at Manchester draws active adults with its exciting indoor and outdoor amenities. The 30,000 square-foot clubhouse is an ideal place to meet with friends or pursue a favorite pastime. The facility features a state-of-the-art fitness center with cardiovascular and strength-training equipment. It also houses an arts and crafts studio, a billiards room, a hobby and game room, a card room, table tennis and a library. The Renaissance at Manchester clubhouse also offers a cafe and deli where residents can meet friends for a casual meal or bring home prepared food. Its spacious clubhouse includes a stage, making it a versatile place for a wide range of performances, parties, activities and community events. Outdoors, the community's beautiful grounds continue with many appealing amenities. Resident golfers can enjoy a private, 18-hole executive course designed by J. Christopher Cummins. Sports courts also provide friendly competition, including tennis, pickleball, bocce ball, basketball, shuffleboard and horseshoes. During the warm summer months, the outdoor resort-style pool is a popular place to cool off with a swim or soak up some sun. The grounds also include scenic lakes and ponds, an RV parking lot and a playground for visiting grandchildren. With its prime location in Southern New Jersey, resort-style amenities and beautiful single-family homes, it's easy to see why active adults love retiring to Renaissance at Manchester.